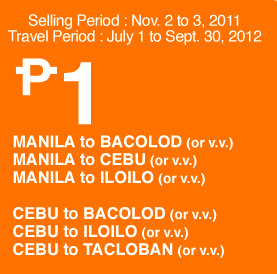 Fly from Manila to Cebu, Bacolod, and Iloilo via Airphil Express for only 1 peso! 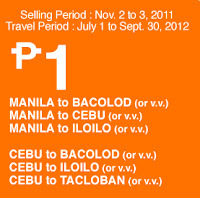 Airphil Express now brings back its latest promo offer for selected domestic flights from Manila and Cebu to Bacolod, Iloilo, and more for as low as 1 peso base fare today November 2, 2011 until November 3, 2011 or until seats last for travel periods July 1, 2012 to September 30, 2012. Until November 3, 2011 or until seats last.